Elvis had made four films prior to 1960: Love Me Tender in 1956, Loving You and Jailhouse Rock in 1957, and King Creole in 1958. All of these movies depict Elvis as a rebel, a young man with an edge, anger lurking beneath the surface. Elvis had dreamed of being a star since even before he began recording his music, and had intentions of being taken seriously as an actor in the same vein as his cinematic heroes. But by 1960, Elvis' manager, Col. Tom Parker, had plans to soften the icon's image into something more family-friendly. 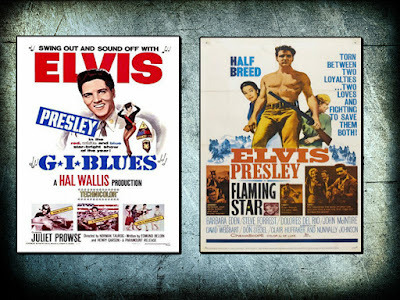 Which brings us to two very different films, both made in the days following Elvis' return from military service, and both depicting two very different career paths. G.I. 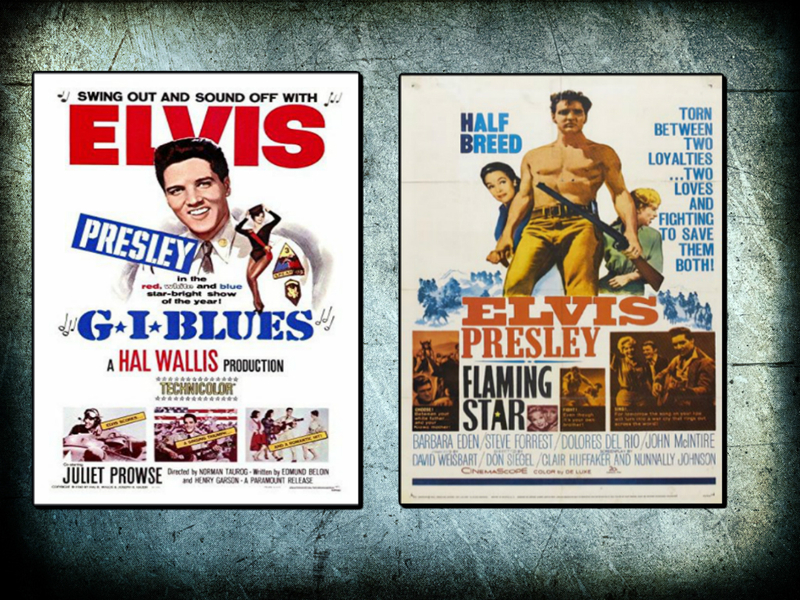 Blues debuted in November of 1960 and is the movie that sets the formula for so many of the Elvis films that would follow. 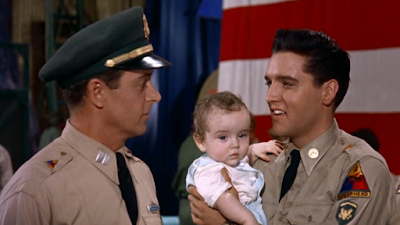 Presley plays Tulsa McLean, a young man in the army who is serving in Germany, just as the young star had done in real life. Elvis is a charming guy who does things his way, frequently playing cute for the camera and practically winking at the audience. There's an unlikely romance in which things don't seem like they're going to work out, but then they suddenly do. Most importantly, the films are full of Elvis music and lip-synced performances. G.I. Blues is the epitome of a safe Elvis movie. There's nothing provocative and there's very little plot worth mentioning. 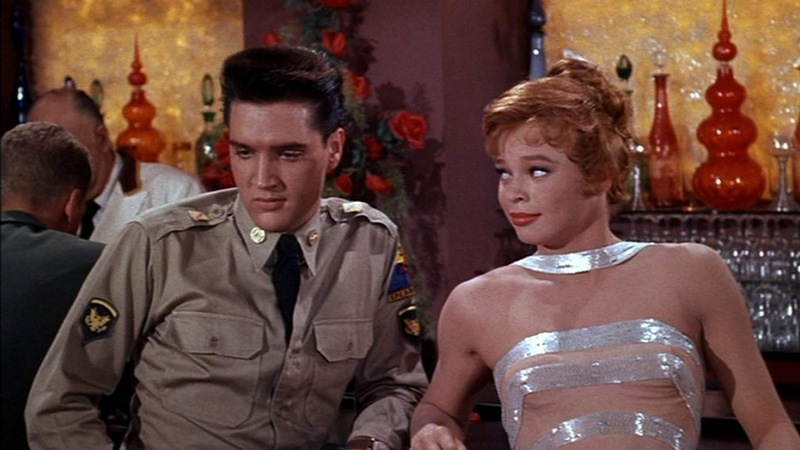 The entire affair is a showpiece for Elvis and a particular brand of wholesome fun that Col. Parker was selling the general public. This wasn't the same Elvis that had gone into the military, with a sneer on his lips and a swivel in his hips. This was a more refined hepcat, cool under pressure and the kind of guy worth taking home to mom. As such, G.I. Blues was such a big hit that it not only established Elvis as a bankable movie lead after being away from Hollywood for the past two years, but it also led to a lucrative partnership with its director, Norman Taurog, resulting in a whopping eight more collaborations between Taurog and Presley, including the smash hit Blue Hawaii the following year. But Elvis had also starred in another movie of an entirely different ilk. Flaming Star is a western with a lot on its mind. In stark contrast to G.I. Blues, it is full of drama and tragedy, and asks quite a bit more of its young lead. 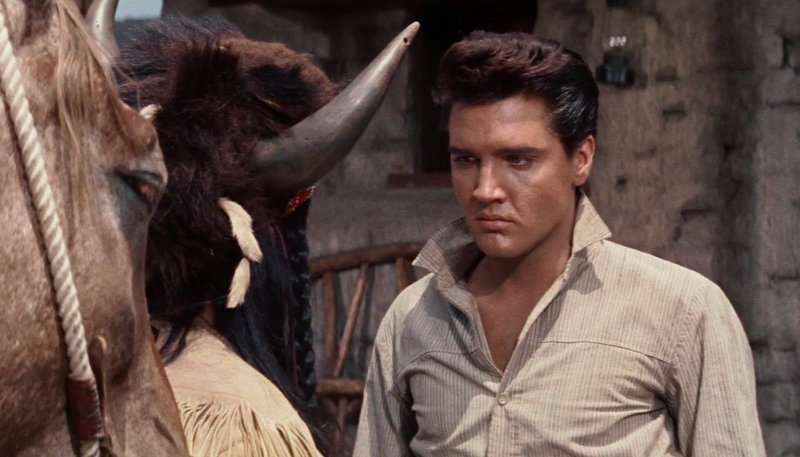 In Flaming Star, Elvis plays Pacer Burton, a young man who has a white man for a father and a Native American for a mother. Pacer feels as if he's always torn between two worlds. The film is directed by Don Siegel, the man who would one day direct Dirty Harry and who Clint Eastwood credits as his biggest teacher. The Elvis in Flaming Star might as well be a completely different actor than the one in G.I. Blues. As the movie unfolds, his character becomes darker and darker, eventually resorting to violence as everything he loves is systematically taken from him. There's a common criticism that Elvis always played himself, but who was the "real" Elvis? Is it the smiling, winking gentleman, or the darker man with a chip on his shoulder? The truth is probably somewhere in the middle. Furthermore, Elvis very clearly had natural acting ability and tried in several films to turn in Brando-level performances. 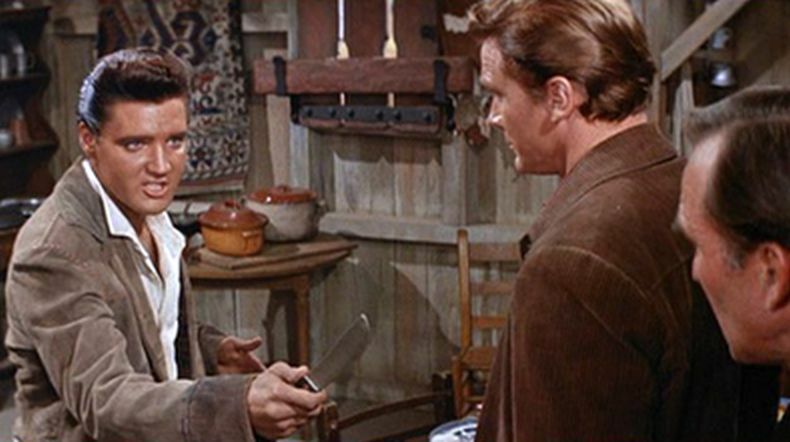 In fact, the two brothers in Flaming Star were originally slated to be played by Frank Sinatra and Marlon Brando. Flaming Star also has the benefit of a fantastic cast, including a pre-Jeannie Barbara Eden, John McIntire, who had just appeared in Hitchcock's Psycho a mere three months prior, and character actor L.Q. Jones (White Line Fever). It only features two songs from Elvis: one of them is sung over the opening credits and the other takes place at the dinner table in a way that feels organic and not at all forced. It's more of a passing nod to Elvis' musical fame than an embrace. Unfortunately, Flaming Star was not a hit when it hit theaters in December of 1960. One could argue that it suffered from being released less than a month after G.I. Blues, but it does also seem to indicate that audiences just weren't as interested in a dramatic Elvis performance as they were in having fun for 90 minutes. Col. Tom Parker had been trying to steer Elvis toward more commercial films that would not only be financially successful, but would also sell soundtrack LPs, and he saw G.I. Blues as the clear path forward. Elvis still wasn't defeated, and he would try once more to convince audiences that he was a serious actor in 1961's Wild in the Country, but it wasn't meant to be. Elvis would spend the entirety of the 1960s starring in one musical film after another, and they almost all fit into the same shallow mold. This isn't a criticism of those movies, because I absolutely love them. I'm a huge fan and proponent of his movie output, as well as the "beach films" from studios like American International Pictures who cranked out Frankie Valley and Annette Funicello musicals in the same fashion that studios cranked out cookie cutter Elvis films. They meet a need and they serve a purpose. There's nothing wrong with movies about beautiful people in beautiful locations having a good time. but it does seem like a shame that the aspirations of Elvis were never realized and that his dreams of being a serious actor never panned out. One need look no further than his pre-1960 film roles to see that he possessed real acting ability that would have improved with age and experience. To me, these two films represent a man at a crossroads. If Flaming Star had out-performed G.I. Blues, how different would Elvis' movie career have been? An entire decade's worth of movies comes down to these two films from the close of 1960, and we are left to wonder.